Oliver Crisp has an illuminating article in his work Retrieving Doctrine examining the innovative, Scottish theologian John McLeod Campbell’s atonement theology, quite accurately titled “John McLeod Campbell and Non-penal Substitution” (92-115). It’s illuminating, not only as it shines light on Campbell’s own theology–as helpful as that is–but as Crisp examines a number of broader issues related to retributive justice, freedom, and atonement theology. In any case, assuming retribution for the sake of the argument, in the sub-section I’m concerned with, Crisp makes two arguments I think worth highlighting. First, he notes that we might think of two versions of retributive justice: a weak and a strong version. The strong version “does not permit forgiveness (without satisfaction)”, while the weak version “does not require forgiveness (without satisfaction)”(97). On one view, God’s justice demands reparation or satisfaction, either by the sinner or a substitute, while the other does not. (Also, “strong” and “weak” are not normative judgments, but indications of the strength of the form). At this point, he stops to ask why most theologians who hold to retribution have defended the stronger view. Many would ask the same. Why not admit that God’s justice has a retributive element, but think that doesn’t necessarily entail reparations? Here Crisp comes to the first argument I was concerned with and points out that this position has some problematic consequences. Crisp’s concerns are roughly this: if the weak view holds, then it seems like God could forgive any sin and any sinner without any reparations, by the sheer grace of a fiat. Well, if that’s the case, then why not just do that for all sins and sinners? On this view, God could be just as just to forgive, redeem, and save all, with none suffering judgment, or pain for sinners, or the pain of the cross for Christ. Now, if that’s the case, then it seems plausible to think that such a world in which that were true, would be an objectively better world, with less evil, pain, and suffering than the current world. But that is an “intolerable” conclusion (98), so he returns to the strong view of divine justice. On this view of justice, “crime must be punished and the punishment must fit the crime.” What’s more, God cannot act unjustly. It is not within him to be inconsistent on this point. God will repay all according to their deeds, as sin (and righteousness) deserve a proper, divine response. And here we come to the second argument. Is God Bound in the Chains of His Own Justice? Oftentimes, in these discussions of atonement theology, it is charged that to think God “cannot” forgive without reparation or satisfaction is a threat to God’s freedom. God, it is said, should not be thought of as bound in chains by his own law. If God has to punish sin in order to forgive, then this legalistic theology gives us a God who is not truly free to forgive and so his sovereignty is compromised. Here Crisp replies that this sort of charge makes two mistakes (99). First, with respect to the nature of divine justice. The “freedom” charge assumes the weak view of divine justice at the outset. But if you already have reasons for setting it aside, then the charge misses the point. I think Crisp has it just right here. The “freedom” charge is not ultimately an objection that holds up when you’ve got a solid grasp of what it means to act in accordance with your nature and your character. Think of Scripture. It is not a deficiency or lack of freedom that Paul is charging God with when he says “God cannot deny himself” (2 Timothy 3:13). God’s inability to lie is the free expression of his essential nature as truthful in all of his ways. God is absolutely free to act in accordance with his fundamental nature as faithful and true. If the strong version of retributive justice is true, then God’s demand of reparation or satisfaction is not a lack of freedom, but an expression of his freedom to be fully himself, just in all his ways. Of course, if you don’t think God’s justice includes (along with a number of other elements) retribution, which returns me to the earlier argument. While I’m on board with both of Crisp’s arguments outlined above, I do wonder about the first a bit more. In response to Crisp’s argument that the world in which God simply forgives all according to weak justice is a morally better world than that in which he doesn’t, it seems you could try to argue that there are other, outweighing goods present in the one which he doesn’t. To do that, you might try to outline which ones those were (though, I’d have a hard time seeing them), or you might more modestly appeal to epistemological limits and claim that there might be outweighing goods which are beyond our limits to know. Sort of like a skeptical theist argument. In addition to theological arguments, this is why I believe we are safer to add Scripture to the argument above as a firmer warrant and foundation for the claims of the strong view of divine retributive justice. Of course, this requires more argumentation than can be mounted here, since a number of serious critiques have been leveled against the idea that divine justice contains the element of retribution according to Scripture, or, at least, according to Jesus’ revelation of God’s justice in the New Testament. …retribution is the principle and standard of punishment throughout Scripture. There is no legislation in antiquity that so rigorously and repeatedly maintains the demand of justice as that of Israel. This comes out especially in the following three things: (1) the guilty person may by no means be considered innocent (Deut. 25:1; Prov. 17:15; 24:24; Isa. 5:23); (2) the righteous may not be condemned (Exod. 23:7; Deut. 25:1; Pss. 31:18; 34:21; 37:12; 94:21; Prov. 17:15; Isa. 5:23); and (3) the rights of the poor, the oppressed, the day laborer, the widow, and the orphan especially may not be perverted but, on the contrary, must be upheld for their protection and support (Exod. 22:21f. ; Deut. 23:6; 24:14, 17; Prov. 22:22; Jer. 5:28; 22:3, 16; Ezek. 22:29; Zech. 7:10). In general, justice must be pursued both in and outside the courts (Deut. 16:20). All this is grounded in the fact that God is the God of justice and righteousness, who by no means clears the guilty, yet is merciful, gracious, and slow to anger, and upholds the rights of the poor and the afflicted, the widow and the orphan (Exod. 20:5–6; 34:6–7; Num. 14:18; Ps. 68:5; etc.). He, accordingly, threatens punishment for sin (Gen. 2:17; Deut. 27:15f. ; Pss. 5:5; 11:5; 50:21; 94:10; Isa. 10:13–23; Rom. 1:18; 2:3; 6:21, 23; etc.) and determines the measure of the punishment by the nature of the offense. He repays everyone according to his or her deeds (Exod. 20:5–7; Deut. 7:9–10; 32:35; Ps. 62:12; Prov. 24:12; Isa. 35:4; Jer. 51:56; Matt. 16:27; Rom. 2:1–13; Heb. 10:30; Rev. 22:12). Each of those references could be fruitfully tracked down, but for those with a hermeneutic oriented towards the New Testament, I would note those last few texts, especially the Gospel reference. As Henri Blocher comments: “Retribution belongs to the teaching of Jesus (Matt 16:27) and remains the principle of judgment (Heb 2:2; 10:30; Rev 18:6; 22:12)” (“The Justification of the Ungodly”, Justification and Variegated Nomism Vol. 2, p. 474-475). Well, as always, there’s far more to say. 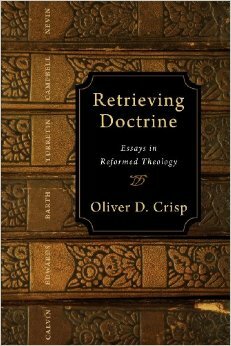 Still, Crisp has given us some helpful distinctions and arguments for thinking more clearly about the notion of divine, retributive justice and the view of God’s freedom to forgive that it entails. Interesting discussion, not that I am committing myself to its conclusions. It intersects with two books that I recently read: Andrew Purves’ book on Christology and the Atonement, which discussed the views of John McLeod Campbell, and John Peckham’s Love of God, which talks about voluntarism and God. Retribution as such is clearly part of what is in play. However, should God declare the fallen nature forgiven – and then simply stop – the fallen nature is forgiven and yet still fallen. It is the case that the Cross of Christ satisfied Deuteronomy’s statement that it pleases God to Judge, Condemn, the guilty, and, in the same verse, it pleases God to Forgive, to show Mercy. So we have a few things going on. The Cross becomes, or actualizes, two contours of necessity which cannot “not-be”, and those are Perfect Justice such that Mercy is aborted, and, also, Perfect Mercy such that Justice is aborted. Each Fire is wholly, factually, ontologically, simultaneously quenched and fully actualized. And then a third element emerges in the Cross. That is this: We come again to the forgiven Fallen Man, standing there, Fallen, and Forgiven, Perfect Justice and Perfect Mercy fully actualized in one metaphysical foci (Christ). Only, the Man is still Fallen. The Cross does something more than either the Law’s Justice or the Law’s Mercy can (could have) ever done – and that is to regenerate – recreate – the Man. Only, as the Scholastics logically affirm, the principle of sufficient causality reveals that such Re-Creation must be ex nihilo for such just is Non-Entity at one moment (Sinless, Uncorrupted) and, then, out of that non-being, Being. And that is where the Cross carries our ontology past all other faith’s stopping points for in the Cross we find “Being Itself” spreading His arms wide, pouring out, exhaling, and this for the beloved, and where there was non-entity there is now that which is filled, made alive, come into being. Faith, the aqueduct, is a hollow, and though necessary for the Man to intersect with Water, it is not and cannot be sufficient. For the Living Door must open, the Living Water must pour out, must enter into, and fill, and make alive. That is why the Faith of the Old Man, though real (Hebrews 11), was, though necessary, utterly insufficient. The Cross transcends the Law in every respect – and that means it transcends both Justice and Mercy. The Cross is perfect mercy just a the Cross is perfect justice. Only, the Cross does not stop where the Law’s ontological contours stop. No. It out-reaches, out-distances, all such contours. The Cross leaves the Law behind, for it is not bound thereby, and then the Cross enters into the prerogative of the Necessary for the Cross just is genesis – just is Love Himself pouring Himself out for, and into, the beloved – who – laying there lifeless – is made alive….. again. The Cross creates, and the creative act of, will of, God is unbounded, wholly free.